...that the Sangheili are oviparous, meaning that they lay eggs rather than giving live birth? ...that Orbital is the first Halo 3 map to be set in space? "Right here, sir. Someone need patching up?" — Responding upon Alice-130's request of Nightingale. The EV-44 Nightingale, formally designated the EV-44 Support VTOL, is a support VTOL aircraft in service with the United Nations Space Command since at least February 2531. The EV-44 Nightingale is a dedicated support unit that uses its complement of multipurpose restoration drones to heal and repair personnel and vehicles. Its relatively simple construction (aside from the advanced drone system) has made it possible to adapt the Nightingale's modern design blueprint to UNSC Spirit of Fire's older factory models. The Nightingale is completely unarmed. However, the craft is equipped with various countermeasures, including the ability to deploy both multi-spectrum smokescreens and disposable jammers capable of camouflaging all personnel and vehicles within the target area. "I'm under fire! And all I got is harsh language." — A Nightingale pilot on Installation 00. During the Battle of Carrow in September 2558, the Surakan Militia Volunteers used armed Nightingales against Hekabe's forces. In April 2559, Nightingales saw action on Installation 00 during the fight between the UNSC Spirit of Fire and the Banished. The Nightingale can be built by all UNSC leaders at the Airpad. In Blitz, the Nightingale costs 70 energy, while a Trooper Nightingale costs 90 energy. When the Trooper Nightingale is destroyed, infantry squads will spawn. Unlike Engineers, the Nightingale can heal up to three units at once due to its drones, but the healing rate is three times slower. The Nightingale is the best unit to heal troops, saving the player from having to use Healing Drones constantly. Another great benefit is that it can heal troops when they are mobile. 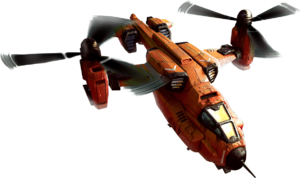 Like most UNSC aircraft, the Nightingale is named after a bird. As the aircraft fills a medical support role, its name is also a likely reference to Florence Nightingale, the founder of modern nursing. The voice cast of Nightingale is same as the voice cast of Jerome-092. Concept art of the Nightingale for Halo Wars 2. A Nightingale on Ricochet in the Halo Wars 2 Open Beta. A Nightingale during the Halo Wars 2 Open Beta. A group of Nightingales near two G81 Condors in Halo Wars 2. A Nightingale deploying smoke to cloak itself.